Since 1980 dozens of Tom’s compositions have been recorded by a host of major artists, including Linda Ronstadt, Johnny Cash, Joe Cocker and Randy Travis. They’ve been featured in films from Twins to Serendipity and Runaway Bride, and in television shows from Miami Vice to Touched By An Angel. An award-winning artist in his own right, he has released seven solo albums, published a book of poems and led songwriting workshops and classes across the US and in Europe. After releasing two critically praised major label albums (in ’87 and ’90), Tom released his first independent album, Bones, in 1994. It was followed by Short Stories, which featured guest performances by Emmylou Harris, the Fairfield Four, Jerry Douglas and other Nashville luminaries. Then came Shallow Water, a collection of spirit-centered songs and hymns, and Light of Day, fourteen raw vocal-guitar tracks recorded in Tom’s home studio. Never Saw Blue, an anthology of TK songs featured in film and TV, is his most recent release. In demand as a songwriting teacher and lecturer, Tom offers workshop instruction tying the creative spirit to the nuts and bolts of composition. 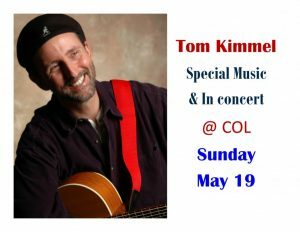 Bottom line: Tom Kimmel is a unique artist who continues to write, record, entertain and inspire at the highest levels! and in concert at 1 pm at Cathedral of Light!! !